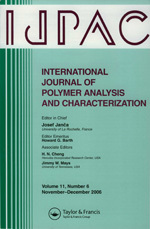 Papers based on the Invited Lectures, contributed lectures and posters presented at ISPAC-2011 may be submitted for inclusion in a special Symposium issue of the International Journal of Polymer Analysis and Characterization (IJPAC). Contributions, which will receive a peer review, will be accepted by the Editor-in-Chief of IJPAC, Josef Janca (ijpac@ft.utb.cz) exclusively as electronic files, e.g., on a floppy disk, CD, etc., or as an e-mail attachment. The special issue will be published as soon as possible, with a target in late 2011 or early 2012. The Instructions for Authors may be found in issues of IJPAC, or online at the URL: www.taylorandfrancis.com. The final deadline for manuscript submission (to be considered for this symposium issue) is to be announced.